Today, 10 April, is the 22nd anniversary of the death of Chris Hani. Hani was a member of the armed wing of the ANC, Umkhonto we Sizwe, and later the leader of the South African Communist Party, taking over from Joe Slovo in 1991. He was assassinated in 1993 outside his home in Boksburg by Polish immigrant Janusz Waluś. 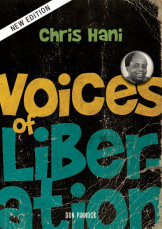 The commemoration of Hani’s death will take place in in Boksburg today, where the Chris Hani Memorial and Walk of Remembrance Monument will be unveiled. President Jacob Zuma will also declare Hani’s grave a Heritage Site. Hani was a key figure behind the “Hani Memorandum”, a document produced and signed by Hani and six other MK members in 1969, which was deeply critical of the leadership of the ANC following the failure of the Wankie and Sipolilo campaigns, the first major operations launched by the ANC in alliance with the Zimbabwe African People’s Union. The ‘Hani Memorandum’, a document produced and signed by Chris Hani and six other members of the African National Congress (ANC)’s armed wing Umkhonto we Sizwe (MK) early in 1969, following the failure of the Wankie and Sipolilo campaigns, is frequently cited but there appears to be no complete copy in a public archive. It has been published only once and that was 30 years ago in an obscure exile journal without identification, date, context, or the names of the signatories – not surprisingly, it seems then to have passed unnoticed.2 In his book ANC: A View from Moscow Vladimir Shubin (1999) provides an accurate summary of the memorandum’s contents, but the copy to which he had access in the Soviet archives seems to have been produced for circulation to the diplomatic community and contained no names and no signatures.